News | Hectic life. Healthy girl. Sure, your diet keeps your body slim and healthy, but its impact doesn’t stop there. The food you eat — from wrinkle-fighting antioxidants in fruits and vegetables to hydrating healthy fats in fish — may matter to your skin almost as much as it does to your waistline. Is your way of noshing helping or hurting your complexion? We asked top docs for their take on the face-friendliness of six popular diets. Read on to see if yours passes the beauty test, and find out how you can alter what you eat for A-plus skin. The lowdown: Fish, leafy greens, olive oil, and fruit are the stars of this heart-healthy, waist-whittling diet. But the benefits don’t end there — eating Mediterranean may also protect against melanoma, the deadliest form of skin cancer, a recent Italian study suggests. On the cosmetic front, omega-3 fatty acids in fish help keep skin-cell membranes strong and elastic. And antioxidants in leafy greens and olive oil may protect against ultraviolet light and other environmental assaults that can break down collagen and elastin, the structural supports that keep skin plump and smooth. Result: less sagging and fewer wrinkles later. Olive oil, tomatoes, and red wine also have antioxidants that help block the chemical reactions that lead to sun damage, explains Leslie Baumann, M.D., chief executive officer of the Baumann Cosmetic and Research Institute in Miami Beach, Florida. Skin Rx: Red wine contains resveratrol, an antioxidant that’s great for skin — but sip in moderation. Overdoing it can dehydrate you, leaving skin dry. Too much alcohol can also generate free radicals, which can break down collagen, leading to wrinkles, Baumann says. The lowdown: Whether you skip meat and other animal products for your health, ethical reasons, or both, you probably eat more fresh produce and whole grains as a result — good news for your skin. The antioxidants in these eats neutralize the free radicals that contribute to wrinkles, brown spots, and other signs of aging. Plant-based protein sources may also have super skin benefits. For example, beans contain zit-battling zinc and decrease inflammation, a culprit behind redness, pimples, and premature wrinkles, says Nicholas Perricone, M.D., author of “Forever Young: The Science of Nutrigenomics for Glowing, Wrinkle-Free Skin and Radiant Health at Every Age.” On the other hand, some studies suggest that dairy contributes to acne, Dr. Baumann says; consider other protein sources if breakouts are a problem. Skin Rx: Veggie diets tend to be low in fat, so incorporate ground flaxseeds and olive and safflower oils to help your skin retain water, making it more supple, Baumann says. The lowdown: First, the good news: Cutting back on white bread, pasta, and refined sugar in order to fight flab can also lower the secretion of the stress hormone cortisol and minimize breakouts, says Manhattan dermatologist Francesca Fusco, M.D. Moderate plans that swap in whole grains, fresh produce, and lean meats also up antioxidants, blemish-busting zinc, and collagen-building protein. 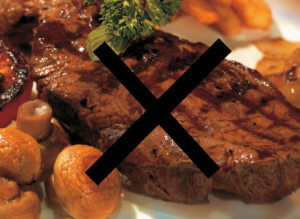 But beware of more meat-heavy plans: Getting some cholesterol from red meat will shore up skin cells’ protective lipid layer, but “eating too much animal fat can result in an increased production of free radicals, which are thought to interfere with normal cellular processing,” says New York City–based aesthetic dermatologist Lisa Airan, M.D. “This may cause premature cell death,” which can lead to sagging skin. Skin Rx: Drink lots of water to keep skin hydrated. Choose fish and other lean proteins — not just saturated fat-laden red meat. Eat antioxidant-rich leafy greens daily. The lowdown: Cutting down on saturated fat — found in red meat and whole milk — is great for your heart and waistline. A diet low in animal fat also stems the production of free radicals that can prematurely age skin, Airan says. Still, your skin needs some fat, especially the good kind found in nuts and olive oil. Fat helps your body absorb complexion-friendly antioxidants and fat-soluble vitamins, and strengthens cell membranes — and ultimately your epidermis — for a dewier, more supple face. Skin Rx: Eat a little fat. “Get at least 20 percent of your calories from fat, mainly the unsaturated kind,” says New York City dermatologist Cheryl Karcher, M.D. Sauté veggies in olive oil, toss nuts into salads, and keep omega-3-rich salmon, flaxseeds, and the occasional fortified egg in your diet. Linoleic acid, found in vegetable oils, is “crucial for bolstering the skin barrier, which keeps moisture in and irritants out of your skin,” Dr. Baumann says. The lowdown: Raw-foodists — who nosh mainly on produce, nuts, and sprouted beans and grains — believe that not cooking food preserves its natural enzymes, aiding digestion, energy, and weight loss. Though these claims aren’t universally accepted by doctors, there’s no denying that these foods make for a happy complexion. What’s more, the healthy oils in nuts, avocados, and olive oil keep skin cell membranes strong and pliant. The downside: “When you eat very little meat, it’s challenging to get enough of the building blocks for collagen,” Airan says. Cleanses are the rage, but do they work? A FRUIT-and-vegetable-based cleansing product Marie Lebair O’Brient uses about every three months makes her feel like she’s getting her eating habits back on track. After following the vegan, gluten-free Kaeng Raeng cleanse program for three days, her taste for salty foods diminishes. She feels more “regular” and is motivated to eat more healthfully. The regimen replaces all meals with a shake and all snacks with raw fruits and vegetables. It’s worth the $60 investment each time, she says, to detox and lose a little bit of weight. Depending on the program — and there are hundreds if not thousands on the market — anecdotal reviews are generally shining. But health professionals warn that people are wasting their money on cleanses and, at worst, they are risking their health. Unlike some cleanses that promise dramatic weight loss in mere days with the help of starvation fasts or added stimulants, there’s nothing sneaky or nefarious about Lindsay Reinsmith’s Kaeng Raeng cleanse or the CAN CAN Cleanse developed by San Francisco’s Teresa Piro. Reinsmith’s Kaeng Raeng follows the principles of a raw vegan diet. A cleanser uses her powders — which contain more than a full serving of fruit and fiber, lean protein, probiotic cultures, amino acids and vitamins — in shakes, and supplements those shakes with raw fruits and vegetables for three to six days. And that’s it. No coffee, no alcohol, no cupcakes or french fries. A healthy dose of water is also prescribed. Reinsmith says most people turn to Kaeng Raeng when they’ve “jumped off the wagon,” meaning they’ve found themselves consuming too much fast food, too much salt or sugar and not enough fruits and vegetables. Piro says her $175 CAN CAN Cleanse — a three-day liquid cleanse program that includes organic fresh fruit and vegetable juices, soups and teas — is a tool to reset the mind and body. “People tend to make some realistic and healthy changes to improve their diets after the cleanse,” she says. People report their cleanses have made them feel lighter. Users notice changes in their hair and skin. Sugar and salt cravings subside, and energy levels increase. Providers of cleansing products, including Kaeng Raeng and CAN CAN Cleanse, say the process eliminates toxins from the body. And some cleansing proponents can be pretty convincing. Add the chemicals found in the air and water with chemicals used in home cleaning products, for example, and additives and preservatives in our food, Reddish says, and you’ll find your body is full of toxins. Cleanses, she says, help remove some of those toxins. The people who participate in her Essential Cleanse, which includes classes, herbal supplements and a detox diet, lose weight and feel much better, she says. Thomas Hargrave, a doctor with Alta Bates Summit Medical Center who specializes in the gastrointestinal tract, is clear about claims of toxin elimination by cleanse proponents. Although she says that eating a diet with lots of fruits and vegetables is great for you, Keri Gans, registered dietitian and spokeswoman for the American Dietetic Association, agrees that cleanses cannot deliver on all the promises their proprietors make. Toxins, she says, are naturally eliminated by bodily functions. “Our bodies are normally cleansing every day. That’s why we have livers. I encourage people who feel like they need to clean out their system to eat fiber. Eat plenty of fruits and vegetables and whole grains every day,” says Gans, author of “The Small Change Diet” (Gallery, $15). As for permanent weight loss, Gans has doubts. Save your money and make your own fresh fruit juices and smoothies says Joan Frank, director of the Didactic Program in Dietetics at San Francisco State University. She warns that cleanses should not be used by children or diabetics, and even healthy people should contact their doctors before they use them. Frank adds it’s best to avoid toxins rather than relying on a cleanse to flush them out. Buy meat with no antibiotics or hormones added. Use the Monterey Bay Aquarium’s Seafood Watch program (www.montereybayaquarium.org) to find out which types of seafood have high levels of mercury and other toxins. Eat organic fruits and veggies or visit the Environmental Working Group (www.foodnews.org) to find out which produce has the most and least amount of pesticides used in production. To learn more about the Kaeng Raeng Cleanse, call 650-646-5474 or visit www.kaengraeng.com. American Dietetic Association spokesman and nutrition expert Keri Gans’ book, “The Small Change Diet,” retails at $15 and can be found at most major bookstores or online. Visit the American Dietetic Association at www.eatright.org for information on nutrition and healthy weight loss. The website can also help you find a local nutritionist. The current media debate about the benefits (or lack of harm) of high fructose corn syrup (HFCS) in our diet misses the obvious. The average American increased their consumption of HFCS (mostly from sugar sweetened drinks and processed food) from zero to more than 60 pounds per person per year. During that time period, obesity rates have more than tripled and diabetes incidence has increased more than seven-fold. Not perhaps the only cause, but a fact that cannot be ignored. Except for one problem. When used in moderation, it is a major cause of heart disease, obesity, cancer, dementia, liver failure, tooth decay and more. The goal of the corn industry is to call into question any claim of harm from consuming high fructose corn syrup, and to confuse and deflect by calling their product natural “corn sugar.” That’s like calling tobacco in cigarettes natural herbal medicine. Watch the slick ad where a caring father walks hand in hand with his four-year-old daughter through a big question mark carved in an idyllic cornfield. Like any parent, I have questions about the food my daughter eats — like high fructose corn syrup. So I started looking for answers from medical and nutrition experts, and what I discovered whether it’s corn sugar or cane sugar, your body can’t tell the difference. Sugar is sugar. Knowing that makes me feel better about what she eats and that’s one less thing to worry about. Physicians are also targeted directly. I received a 12-page color glossy monograph from the Corn Refiners Association reviewing the “science” that HFCS was safe and no different than cane sugar. I assume the other 700,000 physicians in America received the same information, at who knows what cost. In addition to this, I received a special “personal” letter from the Corn Refiner’s Association outlining every mention of the problems with HCFS in our diet — whether in print, blogs, books, radio or television. They warned me of the errors of my ways and put me on “notice.” For what I am not sure. To think they are tracking this (and me) that closely gives me an Orwellian chill. Let’s examine the science and insert some common sense into the conversation. These facts may indeed come as a sweet surprise. The ads suggest getting your nutrition advice from your doctor. Having studied this for more than a decade, and having read, interviewed or personally talked with most of the medical and nutrition experts used to bolster the claim that “corn sugar” and cane sugar are essentially the same, quite a different picture emerges and the role of HCFS in promoting obesity, disease and death across the globe becomes clear. Here are 5 reasons you should stay way from any product containing high fructose corn syrup. Cane sugar and high fructose corn syrup are indeed both harmful when consumed in pharmacologic doses of 140 pounds per person per year. When one 20-ounce HFCS sweetened soda, sports drink or tea has 17 teaspoons of sugar (and the average teenager often consumes two drinks a day), we are conducting a largely uncontrolled experiment on the human species. Our hunter-gatherer ancestors consumed the equivalent of 20 teaspoons per year, not per day. In this sense, I would agree with the corn industry that sugar is sugar. Quantity matters. But there are some important differences. High fructose corn syrup is an industrial food product and far from “natural” or a naturally occurring substance. It is extracted from corn stalks through a process so secret that Archer Daniels Midland and Carghill would reportedly not allow the investigative journalist Michael Pollan to observe it for his book, “The Omnivore’s Dilemma.” The sugars are extracted through a chemical enzymatic process resulting in a chemically and biologically novel compound called HFCS. Some basic biochemistry will help you understand this. Regular cane sugar (sucrose) is made of two-sugar molecules bound tightly together — glucose and fructose in equal amounts. The enzymes in your digestive tract must break down the sucrose into glucose and fructose, which are then absorbed into the body. HFCS also consists of glucose and fructose, not in a 50-50 ratio, but a 55-45 fructose to glucose ratio in an unbound form. Fructose is sweeter than glucose. And HFCS is cheaper than sugar because of the government farm bill corn subsidies. Products with HFCS are sweeter and cheaper than products made with cane sugar. This allowed for the average soda size to balloon from eight ounces to 20 ounces with little financial costs to manufacturers, but great human costs of increased obesity, diabetes and chronic disease. Now back to biochemistry. Since there is there is no chemical bond between them, no digestion is required, so they are more rapidly absorbed into your blood stream. Fructose goes right to the liver and triggers lipogenesis (the production of fats like triglycerides and cholesterol) This is why it is the major cause of liver damage in this country and causes a condition called “fatty liver,” which affects 70 million people. The rapidly absorbed glucose triggers big spikes in insulin — our body’s major fat storage hormone. Both of these features of HFCS lead to increased metabolic disturbances that drive increases in appetite, weight gain, diabetes, heart disease, cancer, dementia and more. When HFCS is run through a chemical analyzer or a chromatograph, strange chemical peaks show up that are not glucose or fructose. What are they? Who knows? This certainly calls into question the purity of this processed form of super sugar. The exact nature, effects and toxicity of these funny compounds have not been fully explained, but shouldn’t we be protected from the presence of untested chemical compounds in our food supply, especially when the contaminated food product comprises up to 15 to 20 percent of the average American’s daily calorie intake? True, pharmacologic doses of any kind of sugar are harmful, but the biochemistry of different kinds of sugar and their respective effects on absorption, appetite and metabolism are different. The last reason to avoid products that contain HFCS is that they are a marker for poor-quality, nutritionally depleted, processed industrial food full of empty calories and artificial ingredients. If you find “high fructose corn syrup” on the label, you can be sure it is not a whole, real, fresh food full of fiber, vitamins, minerals, phytonutrients and antioxidants. Stay away if you want to stay healthy. We still must reduce our overall consumption of sugar, but with this one simple dietary change you can radically reduce your health risks and improve your health. While debate may rage about the biochemistry and physiology of cane sugar vs. corn sugar, this is, in fact, beside the point (despite the finer points of my scientific analysis above). The conversation has been diverted to a simple assertion that cane sugar and corn sugar are not different. 1. We are consuming HFCS and sugar in pharmacologic quantities never before experienced in human history — 140 pounds a year vs. 20 teaspoons a year 10,000 years ago. 2. High fructose corn syrup is almost always found in very poor quality foods that are nutritionally vacuous and filled with all sorts of other disease-promoting compounds, fats, salt, chemicals and even mercury. First off, let me tell you that I’m a friendly vegan! I’m not judgmental, and I truly believe that it’s not my business to tell anyone what they should or shouldn’t eat. I grew up in the South, greatly enjoying chicken-fried steak and barbecued ribs, and every kind of cheesy thing I could get my hands on. I loved meat; never thought about it. Until I thought about it. After a few years of transitioning, I’ve been vegan for seven years. And it seems I’m not alone. I went out to dinner last night with friends and came home fairly hungry. If you don’t count the bread I tried not to eat too much of and the olives from my martini, or the little side dish of steamed vegetables, there wasn’t much I could call a meal. I scanned the menu for anything that I could eat, but all I saw was lobster, lamb, fish, steak, chicken, veal, pork, and pastas that had any combination of the aforementioned meats with cheese or cream. Nothing for me but the dreaded Grilled Vegetable Plate. I would SO love a hearty dish with a center of the plate protein, with some TLC from the chef — i.e. sauces and garnishes — to make it just as fulfilling as the meat and dairy dishes. I would pay good money for it! And I know a lot of other people would too — and not just vegan people. Eating vegan(ish) or vegetarian is mainstream now, and growing ever more so. Oprah, Ellen and Martha each devoted shows to eating vegan. “Good Morning America,” “Extra” and “Dr. Oz” have also dedicated segments to the growing popularity of eating less meat and more plant-based food, and you will find in just about every major magazine or newspaper, there are features about the ever increasing vegan trend. Natalie Portman, Tobey McGuire, Ellen DeGeneres, Portia de Rossi, Mike Tyson, Bill Clinton, Larry Page, Biz Stone, Ricky Williams and Tony Gonzales are all vegan (or veganish! ); these folks are the trendsetters — actors, athletes, business and thought leaders. Whether it’s because someone wants a break from animal protein three meals a day every day, or they are concerned with their health or weight, or they want to be conscious eaters for the environment, a vegan option is extremely appealing when presented well. The problem is, restaurants are generally not presenting them well. A plate of vegetables situated next to a baked potato is okay in a pinch, but I wouldn’t want to pay a lot for it, nor would I return to that restaurant for it. I would choose another place that everyone would be happy, where my husband could get fish and I could get something plant-based (and not just pasta with tomato sauce … too many carbs, and boring). A meal that looks like what everyone else is enjoying would be so, so gratifying and appreciated! And there are so many ways to make a meal with a vegetarian protein using Gardein (looks and tastes like different meats, high protein, low fat and is available through distributors like Sysco and US Foods ), seitan (wheat protein … made into cutlets or strips), lentils, beans, tofu, chickpeas, tempeh or other high-protein meat alternatives. And on a business note, the profit margin is greater as plant-based protein is cheaper than animal protein, and is how many other cultures get protein. – In a 2010 study from marketing firm Context Marketing that included 600 respondents, they found that 21 percent said “vegetarian” is important or very important to them. Fourteen percent said “vegan” is important or very important to them. – The average American ate 14 pounds less meat (including poultry) per year in 2009 (208 pounds per person) than in 2006 (222 pounds per person). oversees, in 2005-2006 an average of 8 percent said that they were vegetarian. The 2009-2010 survey, however, had very different results: 12 percent identified themselves as vegetarian. – According to a January 2011 USA Today article on marketing trends for 2011, 47 percent of Americans are trying to reduce their meat consumption. – A 2009 issue of Nation’s Restaurant News suggested adding vegetarian/vegan options to the menu as one of its top strategies for improving business. The publication noted that vegetarian food is generally less expensive for restaurants to procure, and mentioned the “veto vote,” the tendency for families with one or more vegetarians to bypass any restaurant that serves no meat-free fare. Let me just leave you with this: I often dine out in Santa Barbara, and my favorite restaurant is Lucky’s Steakhouse. They make a mean martini and have a fantastic wine list, and the ambiance is festive and fun. 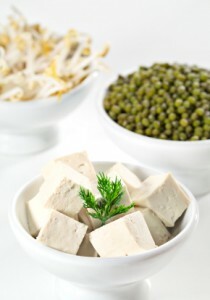 They now feature a tofu dish, right alongside the steak, chicken and fish on the menu. A few friends and I had requested something other than the dreaded Grilled Vegetable Plate for so long, they finally relented. Not happily, at first, but they did it. They took one of their fish dishes and simply swapped out the fish for tofu, grilled it over braised spinach and a sweet miso sauce. I usually start with a chopped salad of three kinds of lettuce, chickpeas, onions and avocado. We get a side of sweet potato fries to share. I asked the manager how the dish was doing, and he said, “I’m shocked, but it’s flying out the door!” His customers are not vegan. Not even vegetarian or pescetarian. But everyone these days, it seems, wants to lighten up on meat a bit. And so they come to the steakhouse for the ambience and a good drink, and they enjoy a hearty protein-centered, plant-based meal, and everyone wins! The other restaurants, we simply don’t consider anymore because we want everyone — veg or carnivore — to be happy!